(a) To cancel a Contract in accordance with your legal right to do so as set out in clause 9, you just need to let us know that you have decided to cancel. The easiest way to do this is email us at support@quityourjobin7days.com. If you use this method we will e-mail you to confirm we have received your cancellation. If you are emailing us please include details of your order to help us to identify it. If you send us your cancellation notice by e-mail, then your cancellation is effective from the date you send us the e-mail. 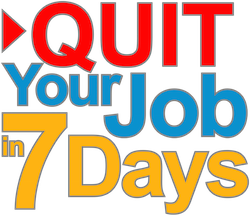 You may contact us by by e-mailing us at support@quityourjobin7days.com. If you wish to give us formal notice of any matter in accordance with these Terms, please see clause 17. 9.4 To cancel a Contract, you just need to let us know that you have decided to cancel. The easiest way to do this is to email us at support@quityourjobin7days.com. If you use this method we will e-mail you to confirm we have received your cancellation.